'There is, I believe, an important link between early Christianity and Sufism. When I read of the Desert Fathers and when I meet Sufis they seem to occupy much of the same position. The Sufis are, of course, a bit outside the mainstream of Islam. The one thing that particularly interests me is the image of the holy fool who, although no longer a stock figure in Christianity, is still important in Sufism. I am wondering to what degree Sufism might have been drawn from early Christianity. "a symbol of peace which in Arabic bears the same root 'S-L-M' as pure religion itself, Islam... And so, the Grail was nothing other than the Black Stone of the Ka'aba, the central shrine of the world's last religion, purified judaeo-christianity, Islam. 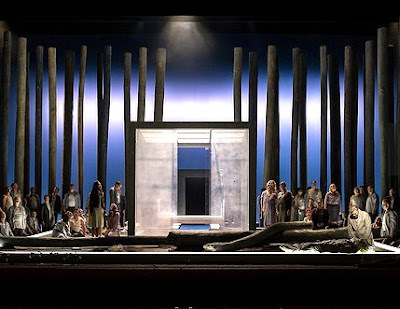 My header image shows the first act of the new Royal Opera House production of Parsifal and below is the image of the Ka'aba that I used in my July 2013 post about Ian Dallas' contentious Islamic interpretation of Wagner. Predictably, media coverage of the new ROH Parsifal dwells on Wagner's anti-Semitism and Buddhism, but misses director Stephen Langridge's tantalising visual hint. Also on Facebook and Twitter. Photo credit Royal Opera House. Any copyrighted material is included as "fair use", for the purpose of study, review or critical analysis only, and will be removed at the request of copyright owner(s). 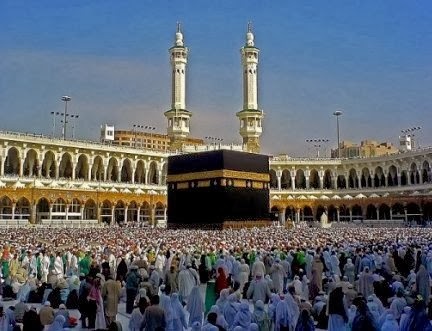 I can't judge whether Wagner or Langridge are specifically citing Islamic icons, but tall, vertical columns are ubiquitous in architecture and used rhetorically in quite a lot of places, including, significantly, The Triumph of the Will and at Ground Zero after the WTC fell. As pure set design, the columns in your pic, scaled at several times the height of the people on stage, suggests to me a collection of silent, omniscient watchers. It also calls to mind the ascent tradition found in all three Abrahamic religions. So whereas you find something tantalizing there, I think it's more akin to observing "You like pizza? I like pizza! BBF!" Hmm. Sounds like the typical wahabi line! Brutus, it was not the vertical columns that triggered a visual cue for me, but rather the central oblong. Billoo, yes Ian Dallas aka Abdalqadir as-Sufi certainly comes with some overweight baggage. But P.T. Mistlberger's The Three Dangerous Magi: Osho, Gurdjieff, Crowley is thought provoking in the way it extracts some important thinking from the heavy baggage associated with Osho, Gurdjieff and Crowley, all three of who are thought, in varying degrees to be fruitcakes.